October 4, 2017 by Cheree' Leave a Comment This post may contain affiliate links, which means if you click on a link and purchase something, I may earn a small commission (at no additional cost to you.) See my disclosure policy HERE. This just might be the PERFECT tunic….it has pockets and priced at just $14.99, WOW!! 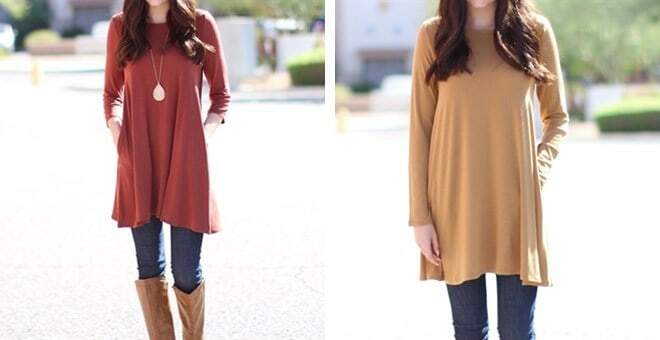 This pocket tunic has soooo many fun fall colors and would be GREAT on GAME DAY! It comes in 3/4 and full length sleeves! You can snag this over at Jane.com. At this price, I'm tempted to get a couple of these adorable pocket tunics! Shipping is $4.99 for the first item and $1.99 for each additional item.